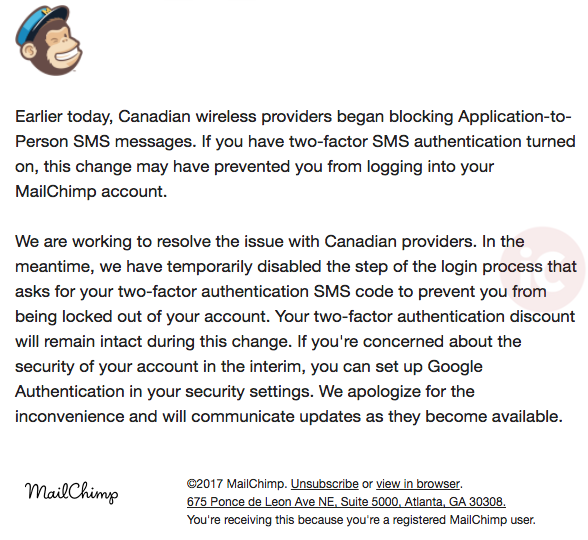 According to email marketing company MailChimp, Canadian wireless providers “began blocking Application-to-Person SMS messages,” as of November 10th. The company says it is working with Canadian providers to resolve the issue, and in the meantime have disabled two-step logins asking for SMS authentication codes (customer 2FA discounts will remain in effect). MailChimp says customers looking to secure their accounts can setup Google Authentication instead within security settings. Two-factor authentication by SMS allows users to add a second layer of security when logging in, instead of just entering a password. Are you being affected this carrier blocking of two-factor SMS authentication codes? We’ve reached out to carriers for comment and will update this post when we hear back. Update Nov. 13, 1:11PM PDT: A Telus spokesperson responded via email to confirm “we do not block this type of SMS”.